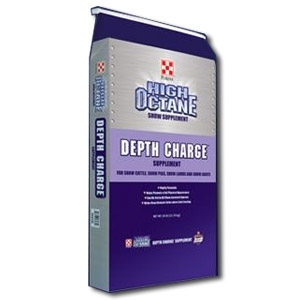 Purina® High Octane® Depth Charge™ Supplement provides multiple sources of digestible fiber to help expand the digestive tract and Diamond V Yeast to help promote a healthy digestive tract. Completed by UltraCare Flavor to enhance palatability and promote feed intake. Ruminant meat and bone meal free. For show cattle, pigs, lambs & goats. Click here for guaranteed analysis and more information.